AWS Config is service for auditing and evaluating the configurations of AWS resources or services. In the first article we introduced AWS Config and created some database instances to evaluate with AWS Config. In this article we shall add AWS Config rules and evaluate the databases, which include RDS, DynamoDB and Redshift. Next, add AWS Config rules for the databases AWS resources created. Select Rules in the AWS Config Console and click on Add rule as shown in Figure 1. AWS Config provides 35 built-in config rules to select from, as shown in Figure 2. We’ve already created a DynamoDB table. In this section we shall add an AWS Config rule for DynamoDB. AWS Config provides the managed config rule discussed in Table 1. Evaluates whether the provisioned DynamoDB throughput is exceeding a configured threshold. By default the threshold is 80% of the account limit. The DynamoDB account limits are different for different AWS regions. accountWCUThreshold: Percentage of write-capacity units for an AWS account. The default is 80%. When the threshold is reached the Config rule is considered as noncompliant. To add the DynamoDB rule, navigate to the AWS Config Console and select Rules. In Add rule search for “DynamoDB”, which should list the dynamodb-throughput-limit-check rule. Click on the dynamodb-throughput-limit-check rule as shown in Figure 3. The Add AWS managed rule wizard gets started, as shown in Figure 4. All the settings for the managed rule are preconfigured. The Frequency may be modified as shown by the 1 hour setting in Figure 4. Scroll down for the rule parameters discussed in Table 1. The rule parameters are preconfigured at 80%, as shown in Figure 5. Click on Save. The dynamodb-throughput-limit-check managed rule gets added to AWS Config Console, as shown in Figure 6. Initially the Compliance is listed as “Evaluating”. It could take a few minutes to evaluate compliance. Two CloudWatch alarms get created for the DynamoDB table: Write Capacity and Read Capacity, as shown in Figure 7. AWS Config provides managed rules for RDS databases, as indicated in Table 2. Evaluates whether high availability is provisioned on an RDS DB instance. Does not evaluate Aurora databases, which are by design highly available. High availability is configured by setting Multi-AZ to Yes. Not all database engines and not all database engine editions and deployments support high availability. As an example, Oracle Database 11g does not support high availability but Oracle Database 12c does. Evaluates whether storage encryption is enabled. kmsKeyId: KMS Key Id or ARN used to encrypt database storage. Evaluates whether backup is enabled on the RDS DB instances. All the parameters are optional. backupRetentionPeriod; Retention period for storing backups. preferredBackupWindow: Time range in which backups are created. To configure AWS Config managed rules for RDS DB instances, search for “RDS” in Rules>Add Rule in the AWS Config Console. The four Config rules discussed in Table 2 get listed, as shown in Figure 8. The managed rule cloudwatch-alarm-resource-check is not for an RDS instance but may be used with an RDS cluster. We shall discuss the cloudwatch-alarm-resource-check managed rule with an Aurora DB cluster. Add each of the four rules discussed in Table 2. To add a rule, click on the rule. Start by adding db-instance-backup-enabled for which click on the db-instance-backup-enabled rule as shown in Figure 9. The Add AWS managed rule wizard gets started, as shown in Figure 10. The Rule parameters Value may be kept blank, as these are optional. Scroll down and click on Save as shown in Figure 11. Similarly add the other threemanaged rules for RDS. For the cloudwatch-alarm-resource-check managed rule specify Rule parameter resourceType to AWS::RDS::DBCluster and rule parameter metricName to CPUUtilization as shown in Figure 12. Click on Save. The managed rules added take a while to audit compliance of the AWS resources and are listed with Compliance status as “Evaluating”, as shown in Figure 13. When a managed rule evaluation completes and all the AWS resources configured with the managed rule are compliant, the Compliance status becomes “Compliant”, as shown for the db-instance-backup-enabled managed rule in Figure 14. If a managed rule is not compliant for some AWS resources the Compliance status gets listed as noncompliant resource(s ) and includes the number of resources that are noncompliant, as shown in Figure 15. The number of resources is indicated only for the noncompliant AWS resources, not the compliant ones. The Compliance status of an RDS database or any other AWS database does not become available while the database is getting created. If the status of an RDS database is “Creating”, as shown in Figure 16, the Compliance status would be “Evaluating”. 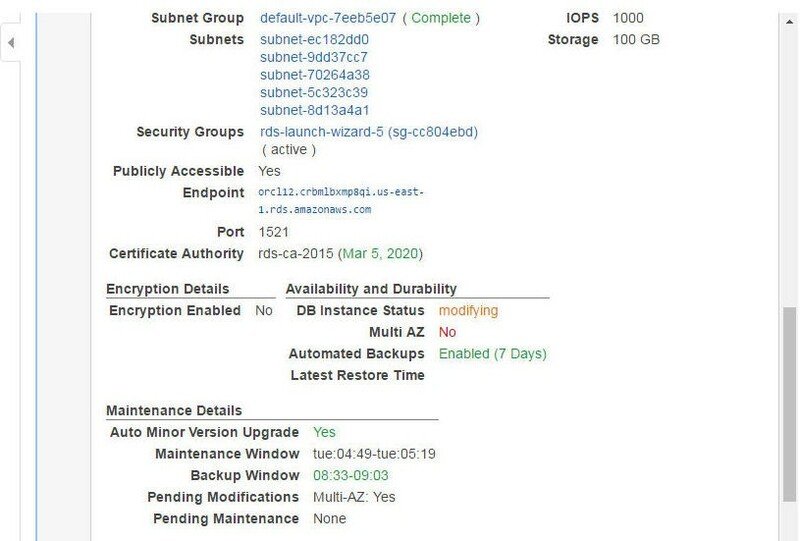 When an RDS DB instance is backing-up, as shown in Figure 17, the Compliance status is “available” because the database has already been created. Click on a Rule name link to find the AWS resources that are monitored by the rule and the Compliance status of each of the resources. As an example, the db-instance-backup-enabled managed rule lists two RDS DB instances as “Compliant” in Figure 18. The rds-storage-encrypted managed rule lists two RDS DB instances as “Noncompliant”, as shown in Figure 19. A managed rule could have some of the AWS resources “Compliant” while some other resources are “Noncompliant”. As an example, the rds-multi-az-support managed rule has two RDS DB instances “Compliant” and four RDS DB instances “Noncompliant”, as shown in Figure 20. While a configuration that is monitored by a managed rule is getting applied and not yet complete its compliance status is Noncompliant. In Figure 21, the RDS DB instance for an Oracle EE Engine based Oracle Database 12c is modifying, as indicated by the “Applying modifications to convert to a Multi-AZ DB Instance” Event. The managed rule rds-multi-az-support monitors the Multi AZ support. The Multi AZ status for the RDS DB instance is “No”, as shown in Figure 22. The Maintenance Details lists Pending Modifications of Multi-AZ: Yes. The rds-storage-encrypted Managed Rule is listed as “Noncompliant” for two RDS DB instances in Figure 29. To make an RDS DB instance Compliant with managed rule rds-storage-encrypted the Enable Encryption must be set to Yes, as shown in Figure 23. If the Compliance status cannot be determined because no result is available the status is listed as “No results available”, as for the cloudwatch-alarm-resource-check managed rule in Figure 24. Account limits for RDS also limit the configurations that may be used. AWS Config provides the managed rules for Redshift discussed in Table 3. Evaluates whether a Redshift Cluster has the specified configuration settings. Three configurations may be evaluated. clusterDbEncrypted: Whether database encryption is enabled. node Types: Whether a specific node type is used. loggingEnabled: Whether audit logging is enabled. Evaluates whether a Redshift Cluster has the specified maintenance settings. Three configurations may be evaluated. allowVersionUpgrade: Whether version upgrade is enabled. Default value is “true”. preferredMaintenanceWindow: The scheduled maintenance window. Optional parameter. automatedSnapshotRetentionPeriod: Number of days to retain automated snapshots. Default value is 1, which indicates 1 day. To add Config rules for Redshift, search for “Redshift” in AWS Config>Rules>Add Rule as shown in Figure 25. The two managed rules discussed in Table 3 get listed. Click on a managed rule to add the rule. The default configurations for the three rule parameters are pre-specified, as shown in Figure 26. Click on Save to add the managed rule. The redshift-cluster-maintenancesettings-check is “Compliant” and the redshift-cluster-configuration-check is “Noncompliant”, as shown in Figure 27. All the rule parameters values must be as specified in the managed rule for the managed rule to be compliant. The redshift-cluster-configuration-check is Noncompliant because, while two of the rule parameters are compliant, one is noncompliant. The Node Type is dc1.large, as shown in Figure 39, which is the same as specified in the rule parameter nodeTypes (true). The Encrypted property is Yes, which is also in compliance with the clusterDbEncrypted rule parameter value of “true”. The rule parameter loggingEnabled is set to “true” while Audit Logging Enabled is No, as shown in Redshift Console in Figure 28. To make the managed rule redshift-cluster-configuration-check compliant, set the loggingEnabled rule parameter to false as shown in Figure 29. After modifying the rule parameter value, re-evaluate managed rule compliance. To re-evaluate compliance click on Re-evaluate as shown in Figure 30. The Compliance status should become “Compliant”, also shown in Figure 30. The Compliance column value for redshift-cluster-configuration-check managed rule in the Rules table also becomes Compliant, as shown in Figure 31. The account limits for Redshift limit the configurations that be applied. It may need to be determined whether a managed rule has been evaluated since being modified or when a managed rule was last evaluated. The last successful invocation and evaluation for a managed rule may be found from the managed rule detail page, as shown for rds-multi-az-support in Figure 32. AWS resources that are being monitored for managed rule compliance may be found by Resource Type and by Tag/s on resources in the Resources Inventory. Select the resources in the Resources drop-down as shown in Figure 33. Click on Look Up to list the resources as shown in Figure 34. The AWS resources get listed, as shown in Figure 35. Alternatively, tags on AWS resources may be used to find resources. As an example, click on Tags to add tag/s to a MySQL Database RDS DB instance, as shown in Figure 36. In the Tags table click on Add/Edit Tags as shown in Figure 37. Add a Key/Value for a tag and click on Save Tags as shown in Figure 38. The tag rds-engine-type with value mysql gets added, as shown in Figure 39. In Resource Inventory specify the rds-engine-type tag and click on Look up to list the RDS DB instance as shown in Figure 40. 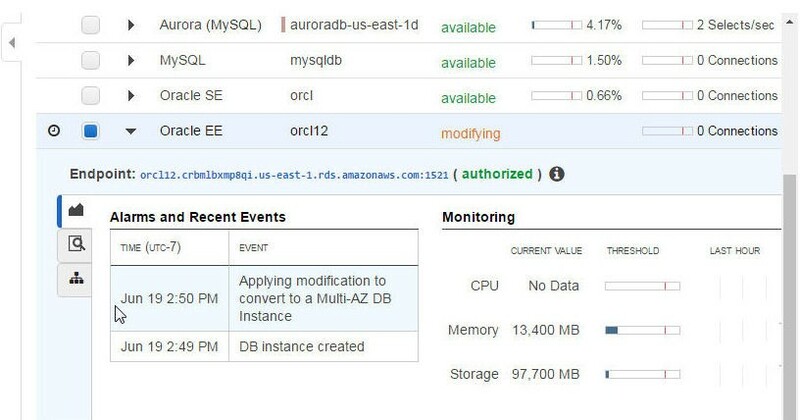 In this two-article series, we discussed using AWS Config to monitor and evaluate compliance for configurations on AWS databases, which include RDS DB instances and Aurora DB Cluster, DynamoDB, and Redshift. Using managed Config rules to monitor compliance of configurations on AWS databases is a coding best practice.